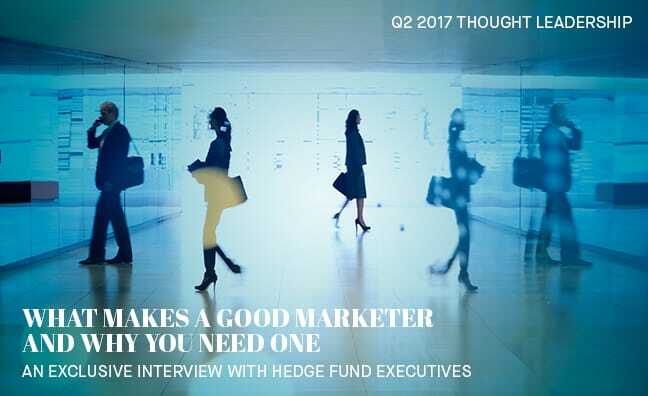 To get to the root of this question, I asked three industry leaders to provide commentary from their prospective: a hedge fund manager, an allocator, and an asset management COO/marketer. Michael Vranos, CEO and Founder of Ellington Management Group, a $6.5bln AUM hedge fund, spoke to me about how he thinks about his marketing team and their responsibilities. Having been in the game for over 20 years, and a widely regarded industry legend, he has seen the evolution and importance of marketing. Chris Cutler, Senior Hedge Fund Due Diligence Analyst and Founder of Manager Analysis Services, spends a significant amount of his time speaking with marketers who solicit his allocation. His feedback on what resonates with him when he meets marketers is truly valuable. Alex de Calice, Founding Partner, COO, and Head of Marketing at Nara Capital, added his view on the challenges marketers face on the front lines. He is a top marketing professional and management executive who has built and managed marketing teams. The major takeaways were clear; marketing is an essential part of an asset management organization, and the role is constantly evolving. All commentators agreed that it has become increasingly harder to attract assets, and therefore the bar for marketers has been raised. As demand for Financial Planning & Analysis’s (FP&A’s) services has increased in recent years, teams are having to work ever harder on analytical projects just to maintain a significant influence on business decisions. Last month, we brought over 30 heads of FP&A together to discuss how the world’s leading companies aim to increase the impact of FP&A’s business analysis. Four good takeaways came from these discussions. Overall, the most successful FP&A teams are more concerned with being a champion for better use of data analysis. Takeaway 1–Set expectations for analyst behavior: The heads of FP&A generally agreed that a good process for generating insights must start with clear guidelines on what analysts should do in specific situations. Managers should reinforce this framework through formal and informal coaching sessions and best practices sharing amongst analysts.